Rock royalty pay their respect to one of their own revered leaders on this great tribute album. To celebrate one of rock's most powerful voices, an all-star group of his friends and fans recorded 13 of their favorite tracks for a tribute album that will raise funds for the Ronnie James Dio Stand Up and Shout Cancer Fund (diocancerfund.org). Produced by his longtime manager and wife Wendy Dio, the album includes contributions by such metal heavyweights as Metallica, Mot¶rhead, Scorpions, Anthrax, and Rob Halford, as well as appearances by many of the musicians who performed with Dio over the years. Ronnie James Dio is one of the most beloved figures in rock history. His gifts, both as a singer and songwriter, are instantly recognizable, whether he was with Rainbow, Black Sabbath, Heaven & Hell, or leading Dio. Sadly, Dio lost his battle with stomach cancer in 2010 but his towering voice and legacy live on. To celebrate one of rock's most powerful voices, an all-star group of his friends and fans recorded 13 of their favorite tracks for a tribute album, released this past April, that raised funds for the Ronnie James Dio Stand Up and Shout Cancer Fund (diocancerfund.org). 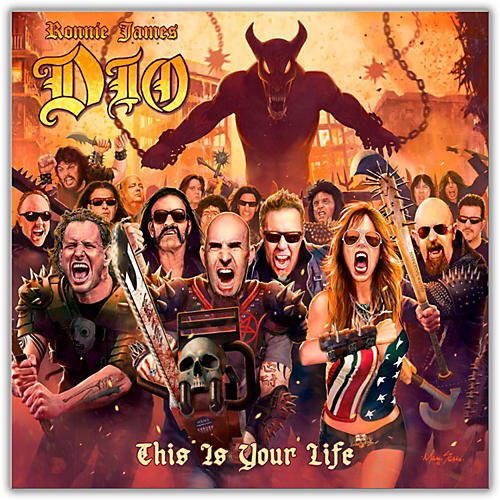 Produced by his longtime manager and wife Wendy Dio, the album included contributions by such metal heavyweights as Metallica, Mot¶rhead, Scorpions, Anthrax, and Rob Halford, as well as appearances by many of the musicians who performed with Dio over the years. The tracks on side A of this release are from that album. The live recordings of Ronnie James Dio on side B are BBC live recordings of Dio at the Monsters of Rock in 1983 and 1987. Order this LP to add to your collection of rocking vinyl today!